* The PC-1074/T is designed for high-security access control and real-time monitoring environments from medium size to complex multi-site installations. 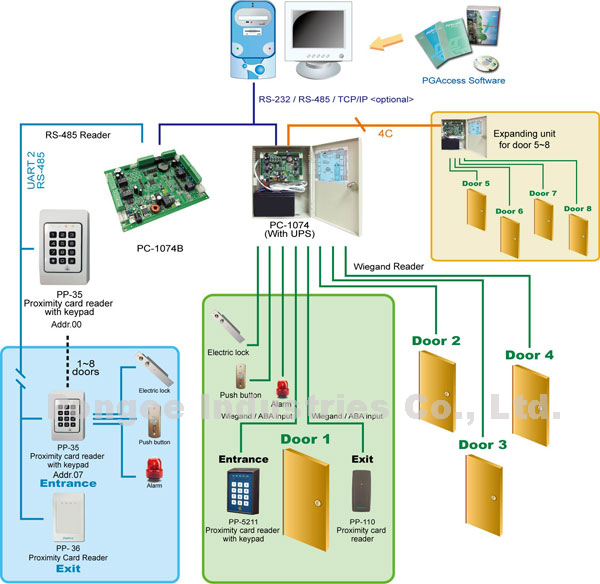 * It is an independent processing 4 doors access control package with metal enclosure, backup battery charger as an efficient space saving design. * Suitable for applications with up to 64,000 users across a modular 1024 doors, allowing maximum flexibility for securing a growing enterprise. Each unit supports 8 Wiegands or RS-485 ports for entry & exit control. * The system support Bar Code, Magnetic Stripe, Biometric and Smart Card Readers thru. Wiegand or ABA interface. 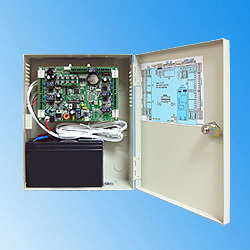 * Designed with 4 DI (digital input) and 4 DO (digital outputs) for light, air conditioning, surveillance, fire prevention or urgent rescuing system control. * Online Network with on board selectable RS-485/RS-232/RS-422 and TCP/IP Ethernet. * Up to 15,000 cards with 32,000 events. Optional 64,000 cards with 64,000 events. * Multi technology of badges include proximity, smart card, biometric, hand free active card, mag. cards, etc. * 8 wiegand readers for 4 doors. expandable to 16 wiegand readers for 8 doors. Optional 8 or 16 RS-485 readers for 8 doors by 2nd RS-485 port. * 4 digital inputs and 4 digital outputs with expansible 24/48/64 relays output for floors control. * Global (4 or expandable 8 doors) or single doors APB without PC autonomous decision at local level without degradation and removable connectors. * Optional baud rate from 2,400 to 38,400 with optional encryption for communication security.